If you are looking to step up to a diesel pusher lifestyle, here's a Winnebago Forza class A diesel model just for you! Model 38F features a beautiful interior, eye-catching exterior, and will make all of your road trips feel like you haven't left home until you look out the windows of course! You are going to absolutely love the space created thanks to a full wall slide behind the driver's seat and two additional slides along the opposite side. This unit also features plenty of conveniences, as well as space. 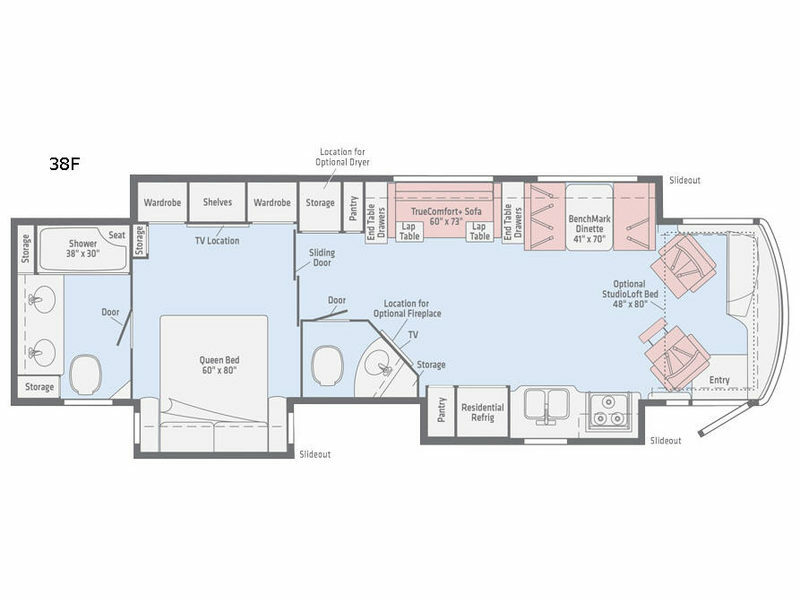 There are one and a half baths with a full rear en-suite bath off the master bedroom featuring dual sinks, a large 38" x 30" shower with seat and storage, plus a toilet. And, the half bath is located mid-coach making it easily accessible to all. The living space up front, behind the captain's chairs, creates an inviting space to sit and relax, enjoy a meal, or watch a little TV with family and friends. You can cook up healthy meals while you travel with the kitchen amenities provided. There is a three burner range and convection microwave oven, a double sink, and a residential refrigerator for your perishables all within a slide out along the curbside. There is also a pantry for your dry goods as well. The seating is plentiful with the swivel captain's chairs being part of the living area once parked. You will also find a BenchMark 41" x 70" dinette at the start of the full wall slide and a TrueComfort Sofa which is 60" x 73" that includes two lap tables plus end tables with drawers on either side. This creates seating for eight individuals total throughout this area when parked. A 48" HDTV is located along the angled outer bathroom wall just off the kitchen slide out for your inside entertainment. You can choose to add an optional fireplace beneath if you wish. A double set of sliding doors divide the coach in two with the master bedroom and bath being tucked away in back for privacy. Just before you walk through the doors to the bedroom you will notice a second pantry and a storage closet that can also house an optional dryer if you choose to add the appliance. Into the bedroom, you will find a comfortable and spacious retreat including a slide out queen size bed with dual nightstands and overhead storage for your things. Opposite the bed there are dual wardrobes and some shelving, plus the location of a 32" HDTV that you are sure to enjoy. You can also select a king size bed in this model instead of the standard queen if you like a bit more sleeping space. The rear en-suite bath off the master bedroom allows two to get ready in the morning with dual sinks, plenty of storage, a toilet, and a nice shower with seat. You also have the option of adding a front cabover StudioLoft bed in this model that is 48" x 80" if you need the extra sleeping space, plus so much more! Parkview RV is not responsible for any misprints, typos, or errors found in our website pages. Any price listed excludes sales tax, registration tags, and delivery fees. Manufacturer pictures, specifications, and features may be used in place of actual units on our lot. Please contact us @800-433-1348 for availability as our inventory changes rapidly. All calculated payments are an estimate only and do not constitute a commitment that financing or a specific interest rate or term is available. Demonstration of the Vehicle, Full LP Tanks, Sewer Hose, Water Hose, Water Pressure Regulator, Toilet Paper and Chemical. Motorhome Rentals Include 100 Miles per Day and a Full Tank of Gas. Each Additional Mile is $.44 and the Motorhome MUST be Returned Full of Gas. All units require a security deposit that is refunded when the unit is dropped off or picked up by Parkview and reviewed, verifing no damage. Any damage will be taken out of Security Deposit. Towables require a $500.00 deposit and Motorhomes require a $1000.00 deposit. Should you cancel the rental for any reason within 30 days of your rental, you will forfeit the entire security deposit. Cancellation 31 days or longer from the rental is charged a $100.00 fee from the security deposit. Motorhomes require an insurance binder, most insurance companies will provide this service. If yours does not, you may purchase MH insurance through MBA Insurance for $27 per DAY with a $10 set up fee.